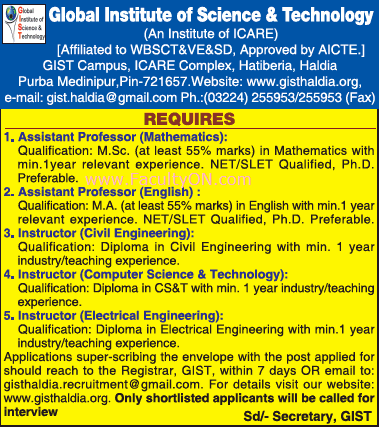 Global Institute of Science and Technology, Haldia has advertised in THE TIMES OF INDIA newspaper for recruitment of Assistant Professor / Instructor jobs vacancies. 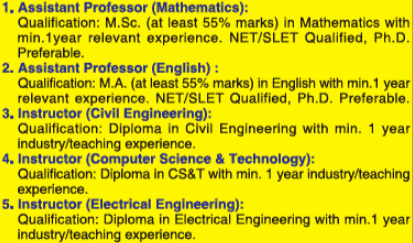 Interested and eligible job aspirants are requested to apply within 07 days from 10th October 2018. Check out further more details below. How to Apply: Interested and Eligible candidates may send their resume along with recent passport size photograph and necessary documents to THE REGISTRAR Post or Email address immediately.